Home > Agriculture & Nutrition > A G-20 Challenge: How Do We Get More Food from Less Water? 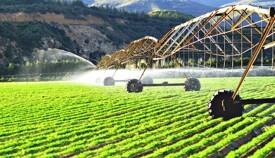 Agriculture strains the world’s supply of fresh water. The question is how do we feed a hungry planet without tapping out the water supply? The link below describes the topic of water that will be brought up at the upcoming G-20 meeting in Germany covering optimal country policies and water preservation strategies for agriculture and for human use.